I am at the moment going through an Italian phase, it is one of my favorite nations for food, generally I love the rustic feel behind the food using simple pure ingredients but producing wonderful flavours. This dish is a fine example of that, the flavours are deep, intense and very satisfying, using fennel which is not something I have used much before, but in Italy it is very much an everyday vegetable, I found it added an extra depth to the dish and I will now be using this a lot more, especially in casseroles and stews. 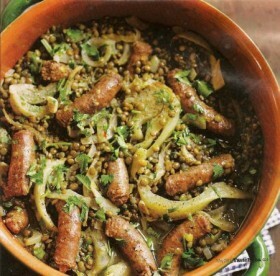 This makes a perfect supper dish or lunch on a sunny afternoon served with good rustic bread and red wine.